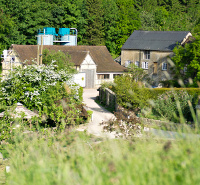 At Shipton Mill, there is more to us than just being a speciality miller of organic flour. We have a deep-seated belief in how we do what we do, as much as making sure that what we do, we do better than anybody. By really understanding our grains, the flour we make and its application, we can help you to achieve truly magnificent loaves, cakes and pastries. We see the sustainability of agricultural systems as encompassing social, ecological and environmental spheres. Preserving and maintaining our earth is at the forefront of our ethos. We are investigating the development of a small hydroelectric power unit to run off the waterwheel. We have also installed a system to return excess heat from the milling process back into the offices to provide space heating in winter and hot water all the year round. We source our grains from local farms for a number of our blends, where practicable. Over the years, we have also built relationships with suppliers across the world who share our values. It is from these suppliers, for example, that we source some of the rare and old varieties of grain that we cannot easily obtain from British shores to make a number of our speciality flours. We aim to reduce packaging and waste first and foremost wherever possible within our business. Beyond this we aim to use sustainable materials and promote recycling of waste packaging wherever possible. As a business we are committed to carbon neutrality and are working towards achieving this in the next 5 years. We aim to produce healthy honest food and al nutritional values for our products are readily available. We are guided by the high standards that being an organic business sets out for us. We do not have direct contact with animals within our business but we take welfare very seriously and look to work with supplier who align themselves with these standards as well.